CM Thunder 2.0 A New Quad-Core Smart Phone of Cherry Mobile To Be Released This June 2013. The successor of CM Thunder, and seventh quad-core mobile of Cherry Mobile, this 5.0 inch mobile phone can be considered as one of the cheapest quad-core smartphone ,why? Because its only P6,299 much cheaper compare to CM Blaze 2.0 and other quad-core phones out there. Cheaper means less specs, but not at all, Cherry Mobile Thunder 2.0 can compete to the released Cherry mobile quad-core phones and to be released quad-core smartphones. 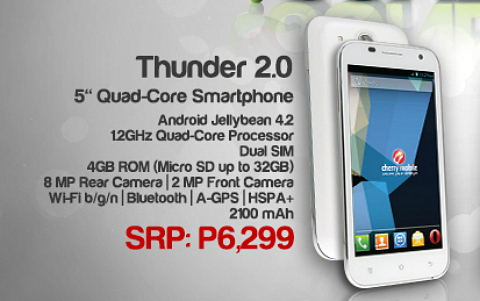 Cherry Mobile Thunder 2.0 is priced at P6,299 SRP. Now available on Cherry mobile stores and kiosk nationwide. Have something to share? Kindly use the comments to share your experience with Cherry Mobile Thunder 2.0. Thanks! kelan po kaya labas nung flare 2.0? Sabi ng Cherry Mobile ngayong June daw. the last i know CM phone are carrier unlock, which means you can use any SIM. I don't see any reason why it shouldn't work, unless you got that phone on wireless plan.